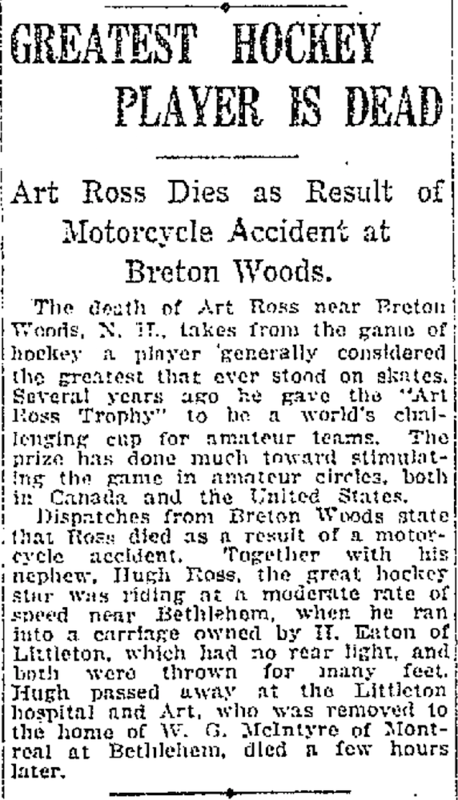 Ninety-eight years ago today, on July 6, 1918 (a Saturday), sports fans reading their favorite newspaper came across reports that Art Ross had either died, or was dying, as a result of injuries suffered in a motorcycle accident. At the time, Ross had just reached the end of a playing career that had seen him widely recognized as one of the greatest players in hockey. Art Ross excelled at many sports, as this cartoon panel illustrates. News of the accident first broke in some evening editions on July 5, 1918. The story claimed that Ross and a nephew, Hugh Ross, had been badly hurt during the evening of Thursday, July 4, and that Hugh died of his injuries at 1:30 am on July 5. 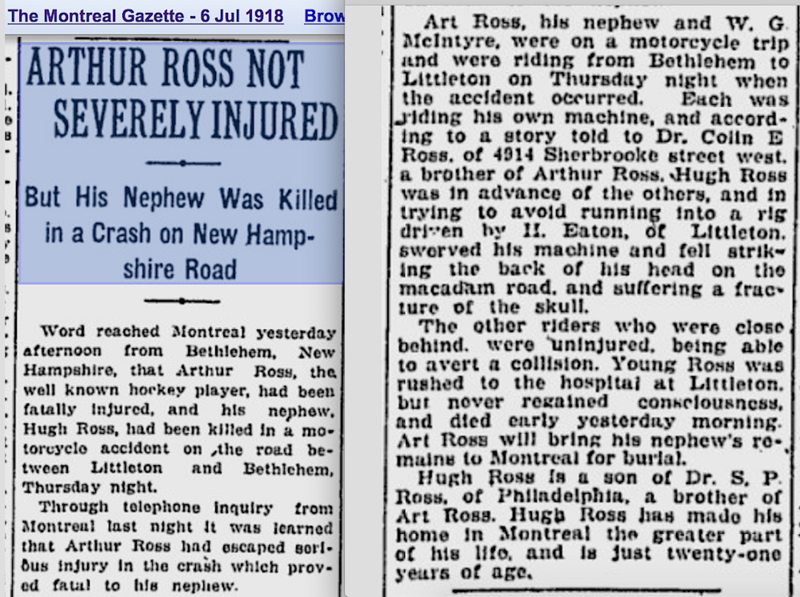 By July 6, most newspapers reported that Ross was badly injured, although some claimed that he, too, had died. Below are reports from the New York Times, and from the Evening Tribune in Providence, Rhode Island, which put the headlines over the wrong stories, but reported that Ross had been killed. 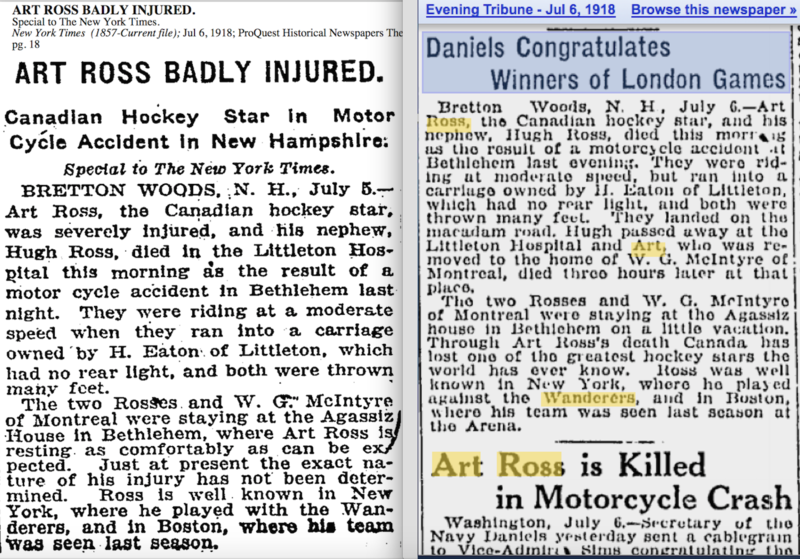 That same day, The Toronto World reported in its sports section on page nine that Ross had died, but the same paper had previously reported on page two that he’d suffered no injuries at all. Fortunately, in Montreal, where Ross’s wife, infant son, mother and brother Colin all resided, the news was cleared up fairly quickly. 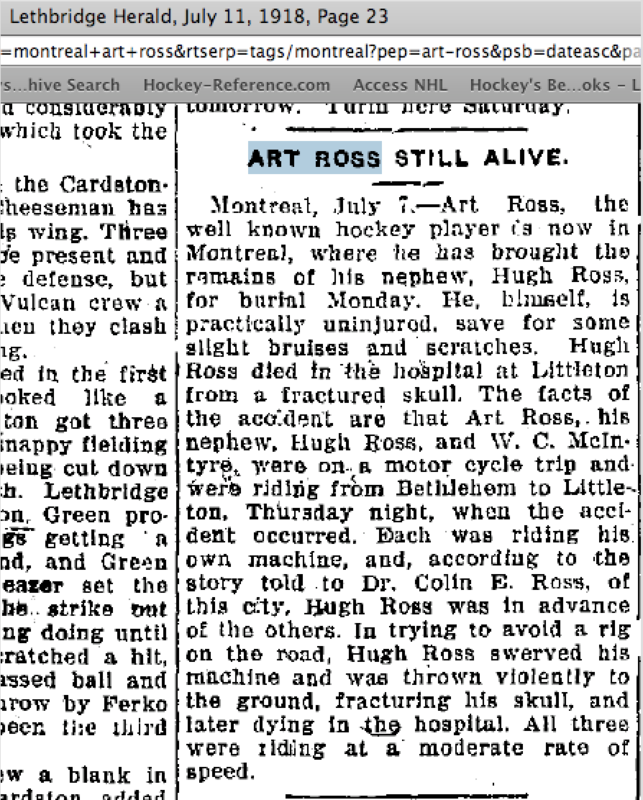 Art Ross was fine, but the sad truth was that Hugh Ross, a few months short of his 25th birthday, had been killed. 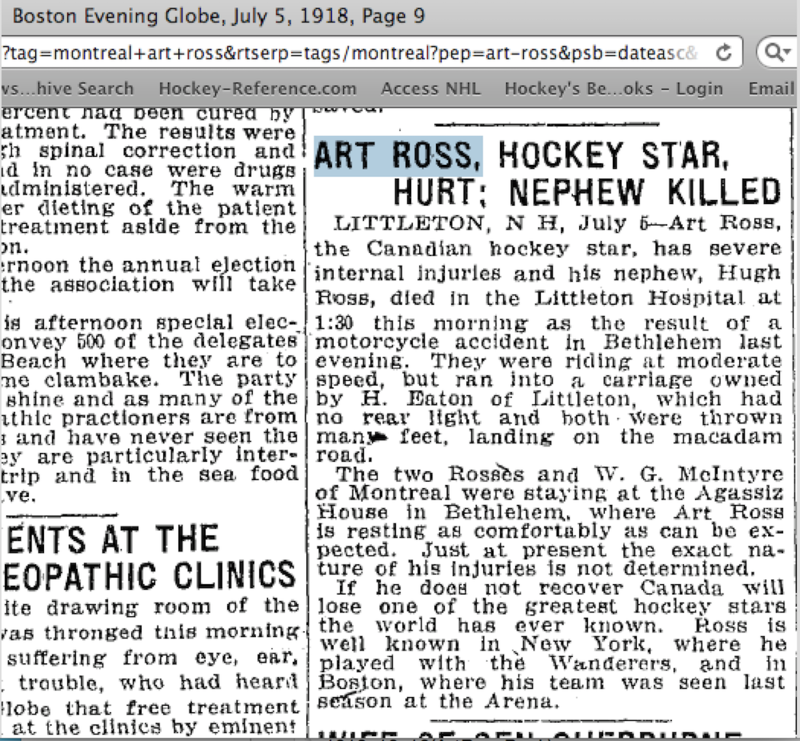 Even so, two days later, on July 8, the Syracuse Herald had a story on its sports page claiming that Art Ross had died. And some newspapers still didn’t have the facts straight for several more days. As I wrote in Art Ross: The Hockey Legend Who Built the Bruins, even now, when a story breaks suddenly, it can be hard to make sense of the conflicting initial reports on the various all-news networks. This was even truer when newspapers were the only real source of news, and so many of them were competing in the same market. If the story of Art Ross’s death in 1918 had been true, the game of hockey might look very different today. It’s a certainty that its history would. Even way back when reporters got facts wrong….some things never change do they? I am sure Art Ross’ family were none too impressed with the mis-reporting!